This high-quality product is made by a leading manufacturer to replace the humidifier filter (AKA water panel, water pad, evaporator pad) in many makes and models of whole house humidifiers. This product is found in the large bypass and fan-powered humidifiers manufactured by Aprilaire, Honeywell, Bryant, Carrier, Totaline, Lennox, Trane, American Standard and many others. 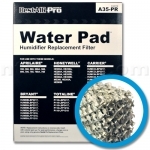 The humidifier filter is constructed using an expanded aluminum mesh pad covered with a special clay-like coating that absorbs water and removes mineral deposits. The process of humidification begins when water flows through a humidifier valve and soaks the filter. Hot, dry air from the furnace or fan coil passes through the filter and absorbs the water. The moist air is then distributed through the home via the forced-air duct system. Dimensions are approximately 10" X 13" X 1-1/2". Dry air can cause a number of problems for you and your household. Alleviate the symptoms of dry air by integrating a whole house humidifier system. The heart of your humidifier system is the water panel, also known as the humidifier filter, water pad, or evaporator pad. The water panel captures water as hot, dry air from your furnace blows across it, providing comfortable, humid air to your home. This model, an aftermarket replacement by BestAir, is compatible with a number of humidifier brands, including Aprilaire, Honeywell, Bryant, Carrier, Totaline, Lennox, Trane, American Standard and many other humidifier manufacturing brands. The BestAir water panel is constructed of an expanded aluminum mesh pad that is inserted into your home or office's humidifying system. This mesh pad is covered with a special clay-like coating that can absorb water and remove mineral deposits. It is recommended you replace your whole house humidifier filter at least once per heating season. Humidifier filters in extended use can accumulate build-up over time. This can lead to reduced efficiency and may cause issues in your filtration system. To alleviate this issue, routine filter changes are recommended to ensure peace of mind and prevent future problems from occurring. Areas with hard water may require two changes per season to ensure peak performance.